You are at:Home»Apple»iPhone 6 vs Galaxy Note 4: Who will come out on top? iPhone 6 vs Galaxy Note 4: Who will come out on top? As we approach the anticipated release of both the iPhone 6 and the Galaxy Note 4, the biggest battle in mobile phone history is upon us. Rumors are swirling more and more, leaving us wondering “Who will come out on top?” Apple plans to release their brand new iPhone with the biggest screen in their mobile phone history, while their adversary Samsung plans to release their phablet, the Galaxy Note 4 which is confirmed to have a QHD display and a metal chassis. One thing that we have learned from this battle already, Samsung and Apple love to hate each other. They also love to take each others ideas that are successful (Apple with the bigger screen and Samsung with the metal chassis). Both companies will move millions of devices, but only one manufacturer will come out on top. iPhone 6: The iPhone 6 is expected to break a first for Apple, and come with a massive screen in Apple’s standards. 4.7″ have become the safe ground for smartphone manufacturers, it’s not too small, yet it isn’t too big. Apple has been conservative over the years with their phones because “why mess with what sells?” Now that iPhone’s are considered the smallest phones by today’s standards, Apple is calling for a change. 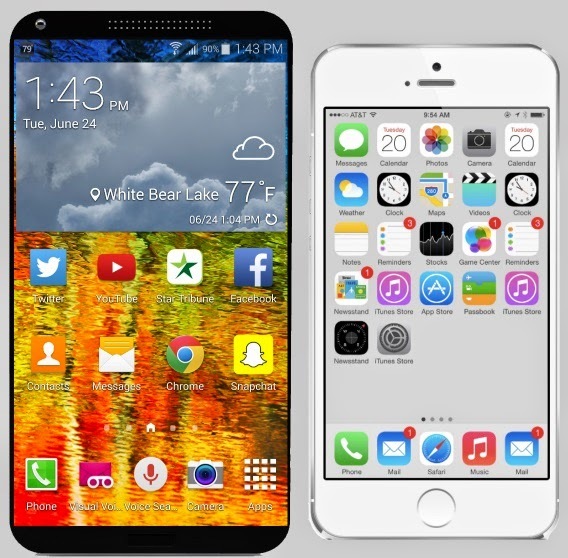 They have already upped the original iPhone from a 3.5″ screen to a 4″ screen. Along with a bigger screen, the iPhone 6 is coming with a new type of screen we haven’t seen on a smartphone yet. Apple is going with a sapphire crystal glass composite that resists scratches more than a standard Gorilla Glass screen. The home button and the camera lens on the iPhone 5S is already composed of solid sapphire crystal that is extremely hard to scratch. This will definitely a huge selling point for the smartphone king. Galaxy Note 4: The Galaxy Note 4 is also expected to break multiple firsts for Samsung, and come with a QHD display and a retina scanner and metal chassis. Samsung has always had vivid displays since the Galaxy S2 became a mainstay on the Android market. The Galaxy S4 was the first Samsung phone with a 1080p display and came with a massive 441 ppi. The kings in display are at it again making their resolution for the Note 4 for be an enormous 2560×1440 or 515 ppi. While they added a fingerprint to the S5, the were already trailing behind Apple. To combat the iPhone head on, Samsung is also reported to be making their first device with a metal chassis. It is reported that Galaxy Note 4 will have at least one model with a metal design, but what market gets that is yet to be known. If this phone is released to the American market, this could be even a bigger feature than the QHD display. Battle: While both phones are coming with new features, yet to be seen on the smartphone market, only one can win. Apple and Samsung have taken aim at one each other multiple times in the past and this will be no different. Apple has always remained on top, but Samsung has been catching up. Apple has kept the premium design a major feature of their devices while Samsung has been pushing displays over design. This September they will collide. Surely Apple’s .7″ jump will be hugely successful, but it is missing one thing: 1080p resolution. The one thing Apple hasn’t gotten right is not adding full 1080p resolution to their phones and it is trailing their competitors Google, HTC, Samsung, and Sony. While their phones have been made up of metal and glass for the premium feel, it hasn’t had the premium screen. This is could be Apple’s falling point with their new flagship device. Samsung will definitely take aim at that and continue to brag about their vivid displays, even more so than ever with a QHD display. The Galaxy Note 3 was one of Samsung’s most popular phones ever. It showed by outselling it’s S4 counterpart. The reason it was so successful was the 5.7″ 1080p screen. While the Galaxy Note 4’s huge selling point will be the QHD display with the same 5.7″ screen, it might bow down to the iPhone 6 unless it comes with a premium design. Many critics have griped about Samsung’s unwillingness to use metal in their design and their sales trailing behind Apple are a major reason for that. Conclusion: The two devices are likely to be majorly successful, just as their counterparts in the past, however this is the biggest battle either Apple or Samsung have ever seen. Apple is taking the right step by upping the display size to 4.7″ and using a new sapphire crystal glass for the screen, but not adding 1080p resolution could be it’s stumbling point. The Note 4’s QHD display could make this the most popular Galaxy phone to date, but if it doesn’t come with a premium design, it could fall even further behind Apple. Only time will tell, and this September we will see if things stay the same or we crown a new King of the smartphone market. Will Apple retain it’s title with the new iPhone 6 or will Samsung overtake them with the Galaxy Note 4. Only time will tell.